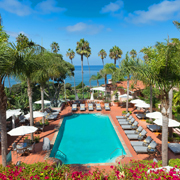 Historic hotels boast long-standing reputations of hosting events with expert professionalism and gracious hospitality. Nestled in "the City of a Hundred Horizons," Hotel Villa Cipriani is the ideal spot for travelers seeking an enchanting Northeast Italian destination, surrounded by a beautiful landscape with endless views. Domus Renier Boutique Hotel is a small yet impressive luxury boutique hotel in Chania, Crete. It consists of nine guestrooms and suites, all different from one another, and most with sea view of Chania Harbor and the Egyptian Lighthouse. The Grand Hotel La Cloche Dijon MGallery by Sofitel is located in the center of Dijon, a city UNESCO has designated as a World Heritage Site. The Grand Hotel La Cloche has been as an iconic symbol in the center of Dijon for seven centuries, and the luxury hotel offers coziness, historical authenticity, and elegant charm. Built in the 18th century by the Saxon king, August the Strong, as a pledge of love to his mistress and faithfully restored in 1995, Hotel Taschenbergpalais Kempinski Dresden is a beautiful combination of historic glory and contemporary elegance. The NH Collection Florence Porta Rossa is thought to be the oldest hotel in Italy, complete with a 13th century tower and ancient frescoes. The hotel’s 72 guestrooms are the epitome of sophistication, fusing old-world charm with modern furnishings in ivory cream and brilliant red. Formerly a magnificent house, this historic hotel is located on Avenida La Paz and has been updated for today’s traveler. Combined with an unbeatable location in the heart of the historic downtown, convenient to specialty dining, lively bars, and eclectic shopping, Casa Madonna La Providence has all the advantages for an unforgettable stay. With ten guestrooms, two of which are master suites that have Jacuzzis and kitchenettes for longer stays, Hotel Gran Casa Xalisco offers everything needed for a pleasurable visit to Guadalajara. The hotel has an on-site restaurant, a bar/lounge, 24-hour business center, complimentary WiFi in rooms and public areas, free parking, concierge services, and laundry services. Hotel San Francisco Plaza welcomes visitors to pause and unwind in one of its 75 enjoyable and comfortable guestrooms; amenities include soundproof windows, cable television, WiFi, complimentary bottle water, and air-conditioning. Villa Ganz Boutique Hotel has 10 beautifully restored guestrooms, decorated exquisitely in a palette of earthy tones and furnished with antiques, European furniture, and decorative Mexican artisan accessories. The Bentley London is discreetly hidden in the quiet residential area of the Royal Borough of Kensington & Chelsea. With 64 luxuriously decorated guestrooms, a brasserie offering traditional English Afternoon Tea, cocktail lounge, and rejuvenating spa, this historic hotel is the perfect choice for the upscale London business and leisure traveler. La Misión de Fray Diego is an antique 17th century mansion, restored and converted into an exquisitely charming boutique hotel in Mérida Yucatán. The landmark Hilton Paris Opera opened on May 7, 1889, during the World’s Fair in Paris. Initially named Hotel Terminus, it was built by architect Juste Lisch and designed to accommodate transatlantic travelers arriving from Normandy via the Saint-Lazare station. The hotel has undergone many renovations and restorations since then, before being purchased by Hilton in 2013. The hotel reopened under its current name in 2015, and has continued to flourish. Hôtel Paris Bastille Boutet – MGallery by Sofitel derives its name from a historic Parisian company named Maison Boutet. The building was a factory for over 63 years, then transformed into a luxury boutique hotel. Since 2015, Sofitel has operated the site as part of its esteemed MGallery collection. The Sofitel Paris Baltimore Tour Eiffel started as a luxurious private residence constructed by the architect Paul Lorin, who recruited Gustave Eiffel to help design the building. The structure is known throughout Paris for its astounding Haussmannian façade. NH Collection Roma Palazzo Cinquecento is an elegant five-star hotel in the heart of the Italian capital. The hotel sits overlooking an idyllic garden, and in front of this garden is a section of the Servian Wall which was constructed to protect “The Eternal City” in the 6th century B.C. Hacienda Santa Rosa, A Luxury Collection Hotel, is a former 17th century manorial house that was repurposed and adapted to serve as a luxury boutique hotel. The Raffles Singapore rose from humble origins as a small seaside hotel that first operated in the late 1800s. When its owner died, the famed Sarkies Brothers acquired the building to develop a luxury hotel in Singapore. Hacienda Temozon, A Luxury Collection Hotel, was formerly a sisal hacienda of the 17th century and beautifully repurposed into a luxury 28-guestroom boutique hotel. The petite 10-guestroom Hotel San Pietro provides guests with blissful accommodations and personalized service to make them feel at home. The NH Collection Turin Piazza Carlina is a short walk to the Royal Palace of Turin, a UNESCO World Heritage Site, along with 13 other residences of the House of Savoy. Without changing its original architecture or fascinating history, this charming and elegant 17th century building, set around a beautiful courtyard, has been renovated into a unique four-star hotel. Kempinski Hotel Cathedral Square is located in the center of Vilnius Old Town, a UNESCO World Heritage Site. Guests can indulge in the finest collection of 96 luxury guestrooms and suites, or dine on local flavors and superior cuisine at the best restaurants in Vilnius, Telegrafas and Bar Le Salon. A lifestyle boutique hotel, dusitD2 Hotel Constance Pasadena is located on the world-renowned Tournament of Roses Parade route in the heart of Pasadena’s business and theater district, within walking distance of world-class shopping, dining, cultural and entertainment options. The historic Candler Hotel Atlanta, Curio Collection by Hilton is located in the heart of the city and is in a prime location to explore Atlanta. The Partridge Inn is located on a serene hilltop overlooking historic, downtown Augusta. This luxurious hotel is a southern classic in one of Georgia's oldest cities. The Festningen Hotel and Resort offers a stunning selection of rooms in a building within this military fortress that dates back to 1771. This historic structure has been updated to include modern comfort while maintaining original details such as wallpaper. LondonHouse Chicago, Curio Collection by Hilton, is a 452-room luxury hotel located at the corner of Wacker Drive and Michigan Avenue, in the historic London Guarantee Building. A gem in the heart of the Loop in Downtown Chicago, The Silversmith Hotel resides in what is still known as the Jewelers Row District and is steps away from Millennium Park, first-class shopping on the Magnificent Mile, and the Art Institute of Chicago. Relax and unwind at this historic luxury boutique hotel in the heart of Beacon Hill in Boston. The AKA Times Square is a residential hotel of 105 suites, including duplex penthouses with terraces, and features a fitness center, rooftop terrace, WiFi in public areas, business center, and concierge services. The Redbury New York is located in the burgeoning NoMad district of Manhattan and features inviting accommodations amidst the energetic city. Originally built in 1927 as an upscale social fraternity for the city's affluent oil barons, the Tulsa Club Hotel, Curio Collection by Hilton, pays tribute to its origins with its beautifully re imagined Art Deco style. Housed in a 13th-century monastery, which once was home to Cistercians monks and Cappuccini friars, the Grand Hotel Convento di Amalfi is perched on a cliff top high above sea level with spectacular views of Amalfi and the Mediterranean Coast and only steps away from the historic city center and the harbor of Amalfi. Hotel Moskva, a Belgrade landmark built in the Russian Art Nouveau style, is one of the most important architectural gems of the capital of Serbia since opening in 1908. With its façade comprised of decorative taupe and emerald ceramic tiles, this iconic four-star, 123 guestroom hotel is located on the Terazije Square in the historic city center. Located in the heart of Bergen, Grand Terminus has offered luxury Norwegian accommodations since 1928. With 131 charming guestrooms and several banquet rooms, Grand Terminus is a popular venue for weddings and events. Originally built by renowned architects Fredrik Arnesen and Arthur Darre Kårbø, the property’s design was awarded with the prestigious architectural Hauen Fonds Diploma. An exceptionally exclusive and resplendent palace, Laxmi Niwas Palace is an awe-inspiring sight boasting an memorizing architectural elements, including symmetrical layouts, ornate filigree work, and latticed screens. Situated in the heart of Bikaner, India, the stately palace was formerly the grand private residence of His Highness Sir Ganga Singh Ji. Hotel Metropole has kept legendary watch at Brussels’ majestic city center since 1895. Its guestbook alone is an elaborate account of famous figures who have walked its halls -- chancellors and generals, award-winning actors and artists, and a dazzling array of dignitaries. Throughout this iconic hotel’s 112-year history, gracious welcomes have been extended to Albert Einstein, Marie Curie, Caruso, and Arthur Rubinstein. Boasting an authentic Colonial experience, the elegant Alfiz Hotel is situated within The Walled City of Cartagena, Colombia and boasts eight individually-designed suites, each reflecting a distinct period of the city's vibrant past. Dating back to the 17th century, the Spanish-Colonial style hotel proudly combines its rich heritage, the offerings of the vibrant port city, and modern luxuries. Once a fortress symbolizing the hardship between the Mewar and Marwar regions, Fort Seengh Sagar has been converted to an exceptionally intimate and luxurious villa. Sitting in the middle of a monsoon-dependent lake amid a dramatic rocky landscape, this island fortress is an awe-inspiring sight only reachable by a dirt road, small bridge, or during the rainy season, by boat. Originally the office building for the Mosvold Shipping Company, Rederiet Hotell is historic hotel in Farsund, Norway illustrating the deep maritime culture of the region. Rederiet Hotell is the ideal destination for seaside charm and comfort featuring guestrooms and suites in two historic buildings, a Functionalist-style structure and the Reymert House, intimate meeting spaces, and a delicious restaurant offering refined cuisine. The Bernini Palace Hotel dates back to 1500 when it started out as a castle. Guests can take in the rich history of the building and of Florence from the comfort and elegance of the plush guestrooms with modern amenities. There are a handful of hotels in the world so iconic, so distinctive that they become synonymous with the city that created them. In Istanbul, that hotel is the Cıragan Palace Kempinski Istanbul. For travelers who want to fully experience the grandeur, elegance, excitement and mystery of one of the world’s most extraordinary cities, there is no other choice. Originally a vacation mansion for the Alsisar family, Alsisar Haveli was built in 1892 in the heart of the Pink City of Jaipur. Fully restored and expanded, Alsisar Haveli was converted into a historic hotel in 1994 and has established itself as a magical property, exuding decadence and luxury fit for royalty. Located in the modest arid village of Alsisar, 23 kilometers/14 miles from the district headquarters of Jhuhjhunu in Rajasthan, the heritage rich Alsisar Mahal palace is an oasis sitting luminously among the battle-hardened desert surroundings. Claimed in 1737 by the ancestors of current heir Thaukur Gaj Singhji, the brilliant Alsisar Mahal is the most recent addition to the Alsisar Group of Hotels. Originally a “staging inn” with one straw bed over a shipping office, Hotel Ullensvang is rooted with deep Norwegian history and traditions. This property has been run by five generations of the Utne family after Hans Utne built the inn in 1846. A cabin in Lofthus near the inn was the inspiration and birthplace of the musical creations by the famous Norwegian composer Edvard Grieg. Little by little, the hotel was expanded and restored to the luxury property that it stands today. Five generations of superb hoteliers have demonstrated their unparalleled commitment to providing an incomparable stay at the legendary Hotel Schweizerhof Luzern in Lucerne, Switzerland. Built in 1845, Hotel Schweizerhof Luzern is one of the few hotels in Switzerland with national significance. Adorned with precious antiques, exclusive objects d'art, luxurious fabrics, and wonderful flower arrangements throughout the property, Casa Azul Hotel Monumento Historico is an enchanting residence at the historic center of Merida, Yucatan. With eight luxurious and individually decorated suites, the hotel is an intimate escape allowing guests to immerse in private tranquility. Enchanted by floral gardens, brilliant courtyards, and serene fountains, Quinta Real Oaxaca is a romantic luxury hotel nestled in the historic center of Oaxaca, Mexico. Built in 1576, the property was originally the Convent of Santa Catalina de Siena and much of the original structure has been carefully restored and remains displayed to this day, including frescoes and restored tile floors. Former home of architect, entrepreneur, and traveler Christian Thams, Bårdshaug Herregård began as a parsonage converted into a thoughtfully decorated personal residence. Today, the 65 guestrooms at the hotel still reflect the intricate details of Christian Thams' passions and history with its decor and original furnishings. Within sight of the Tuileries Gardens, and just moments from the Parisan icon and treasure, the Louvre, Hotel Regina Louvre offers the ultimate in French sophistication and decadence. Surrounded by all of the finest offers of Paris, this Art Nouveau property is firmly anchored in the history of Paris that's reflected in its interior's intricate woodwork and designer lighting. Originally constructed as the Convent of the Immaculate Conception, Quinta Real Puebla is a magnificent 16th century hotel situated in the historic center of Puebla, a city declared a World Heritage Site in 1987. Built in an extravagant Spanish Colonial style, Quinta Real Puebla is teeming with vibrant courtyards, decadent guestrooms, and warm Mexican hospitality. An architectural beauty, Gran Hotel Son Net is the crown jewel of Mallorca, Spain. The 17th-century historic mansion offers exquisitely appointed rooms, authentic cuisine, and a wide array of outdoor entertainment. The recipient of endless accolades, including Trip Advisor’s “Certificate of Excellence” 2011, Gran Hotel Son Net features soaring ceilings, important works of art, and grand guestrooms. Originally an old textile factory established in 1914 and a separate shop and farm built by Johan Natanael Ramm in 1844, Vertshuset Røros is comprised of the two adjacent buildings creating a unique lodging experience with two distinct interiors. The space of the former businesses were converted into 38 comfortable guestrooms and apartments displaying the industrial history of Bergstadens, with rich traditional Røros furnishings in Rammgården or clean modern lines in Uldvarefabrik. The carefully preserved walls Lauritz Smith Pedersen built for his factory over 200 years ago transport guests of the GamlaVærket Hotel to an authentic tour of Norway’s industrial history. With 28 romantic guestrooms, individually furnished and styled, the hotel offers each guest a personalized experience with charming service and amenities reflecting the history of Norway. Boasting the tranquility of its countryside setting, Selbusjoen Hotel & Gjestegard features luxury accommodations situated on the banks of Selbu, Norway. Built in the mid-19th century, before it was converted into the charming hotel that stands today, the property was occupied by a diverse collection of organizations and businesses, including a general store, sanatorium, post office, and a home for the elderly. Once a former Post Office and minutes from the main shopping hub and business district of vibrant Singapore, The Fullerton Hotel Singapore’s neo-classical rooms, soaring Doric columns, hints of champagne colors, and abundant sea and river views are matched by the luxury hotel’s impeccable personalized service and warm surroundings. Nestled in the foothills of Uggdal, Norway, on the island of Tysnes, Haaheim Gaard is a charming hotel boasting a romantic rural setting. Originally built on farmland in 1907, the hotel represents the rich agricultural history that remains integral in the culture and economy today. For over 120 years, Fleischer’s Hotel has been a cultural treasure for prominent guests wanting to indulge in a fairytale experience surrounded by Norway’s natural wonders. Fredirk Lyth Ørum Fleischer opened the hotel in 1864, and it has been operated by five generations of Fleischers. Designated a historic monument and considered one of the oldest western-style hotels in Japan, Hotel New Grand is the epitome of Yokohama history. Established in 1927, Hotel New Grand is an international hotel that has welcomed guests from all over the world. A relaxing respite in the heart of the city, this culturally rich hotel offers unparalleled views of Yamashita Park and Yokohama Bay. From the regal black storks nesting in the eaves to the leisurely flow of riverboats just beyond the terrace cafe, Storchen Zürich is the only Old Town Zürich hotel located directly upon the river Limmat. Renowned for warm hospitality for over 650 years, this historic treasure provides an ideal location for gracious accommodations and efficient service. Designed as a tribute to the Sioux Indian Nation and the German immigrants that settled in the Dakotas, Hotel Alex Johnson is the epitome of historic preservation and world-class hospitality.